To unite individuals with a common interest and provide an avenue for those who have a desire to give to others. That desire may be through an unfortunate personal loss or tragedy, a family or friend’s loss or battle with health, or just the urge to give knowing they can benefit another’s need. YOU CHOOSE YOUR CAUSE and come for a Cruise! 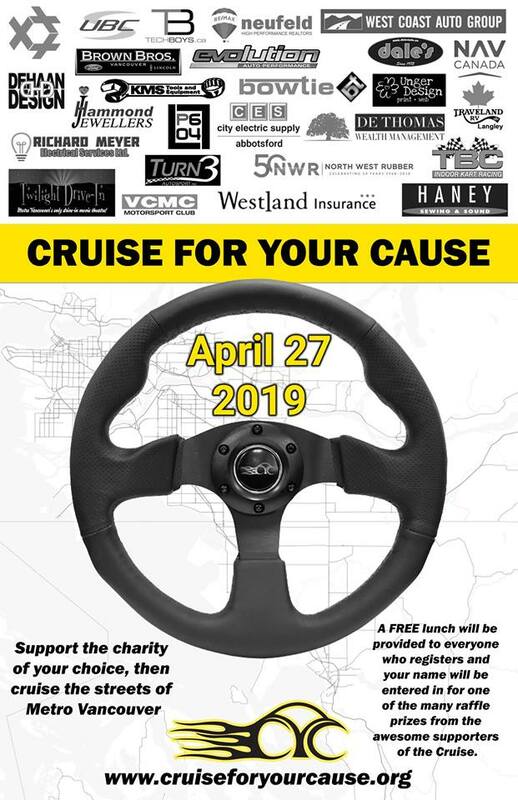 Cruise for Your Cause 2019 is the 8th annual event where YOU get to choose YOUR charity to support. Then come on out for a day of driving and showcasing your favorite vehicle and charity to many other like-minded individuals. Open to all makes and models of cars/trucks/bikes and open to any charity that you can support. The goal for 2019 is another $10,000 in donations and 100 cars attending. The route starts once again at the BC Kidney Foundation HQ in Burnaby, 4940 Canada Way. From there we will travel ~160kms through White Rock, Langley, Maple Ridge and Mission, with a finish at Mission Raceway. Be sure to tell your friends, tell your co-workers and tell your family about the Cruise. Bring your daily driver, bring your hot-rod or winter project-in-the-works. A FREE lunch will be provided to everyone who registers and your name will be entered in for one of the many raffle prizes from the awesome supporters of the Cruise. We look forward to seeing you and your ride out for another Cruise for Your Cause on April 27!! !